Description: The surface of this stretch of Knightsbridge is dirt road rather than paved. The elevation at the top of the sheet shows trees in Hyde Park behind the brick wall. 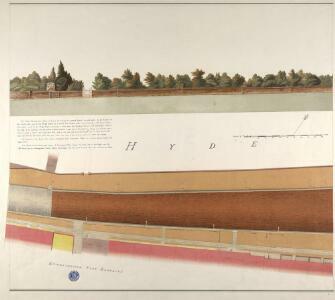 The wall was erected by Charles II after he took the park back into royal hands after the Restoration in 1660.Hyde Park was the largest of all the Royal parks, extending over 340 acres of land. It was originally a hunting ground for deer, boars and wild bull. Bequeathed to the monks of Westminster after the conquest of Geoffrey de Mandeville in the 1140s, the park was appropriated by Henry VIII at the dissolution of the monasteries in 1536. The park was opened to the public at the beginning of the 17th century and deer were hunted there until 1768.